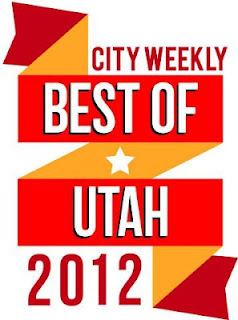 I was honored to receive 3 and a half awards in Salt Lake City Weekly's Best of Utah 2012 competition. The first award was labeled "Best Self-Promoter", but when on to explain that it was for their being impressed with how much I accomplish in my life as a writer, filmmaker, columnist, and quizmaster. Bryan Young is, hands-down, the busiest guy in Utah media that you’ve never met. Aside being a founder of Shinebox Media and Big Shiny Robot! (as well as a contributor to City Weekly), the writer and producer has a long list of projects that makes you wonder when he sleeps. Included in that list: Geek Show Podcast panelist, Huffington Post correspondent, author of five fictional novels, nationally regarded Star Wars expert (he’s received personal invitations to Skywalker Ranch), independent film director, pub-quiz host, and soon—we hope—seller of an energy drink of whatever is keeping him going. Hopefully, it'll get people to check out my books. If you want a taste of the quiz, be sure to pick up my collections of trivia on sale on Amazon and Barnes and Noble. The third is for Best Local Cable Show for The Big Movie Mouth-Off, starring Jeff Vice and Jimmy Martin, which I produce with Elias Pate. Jeff Vice and Jimmy Martin have fast become the biggest names in televised movie reviews in the Salt Lake City area, and it’s no mistake. Filmed at one of our favorite watering holes, Brewvies, their funny, beer-fueled Big Movie Mouth-Off is funny, entertaining and insightful, even when they’re dead wrong about a movie. And their Facebook page is the site of dozens of movie giveaways every month, as well as offering a daily reader poll, making it a must-like. The half of an award is the second place win for Big Shiny Robot! for best site in Utah. Last year we squeaked out blogger Gavin Sheehan for the top spot, this year he squeaked us out. Congratulations to him and everyone else who won this year! I also participate on occasion (and film) another award winner for best podcast, The Geek Show Podcast. It was a very good year for everyone I know.